You can read more about how we manage our finances here. 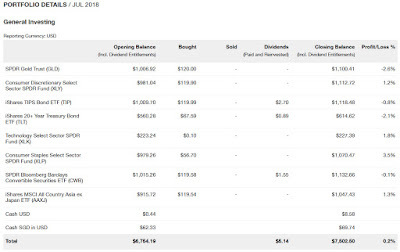 Removing our shared expenses which come out of our mutual fund (KPO Expense Fund), my expenses for July would be $3,169.84 - ($1,943.80 / 2) = $2,197.94. ROM (Registry of Marriages) - This is important! We read horror/funny stories of how couples forgot to file a notice with ROM within the deadline. The earliest you can file is 3 months in advance and the latest you can file is 3 weeks before your wedding date. Apparently, you can check if your other half is already married, we had some fun checking our parents' anniversary and reminding them about it after all they no longer celebrate it. Ring - Decided to engrave our wedding band. 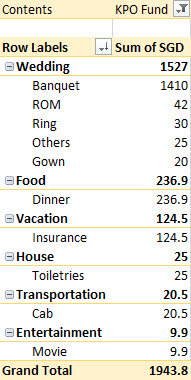 My food expenses are exceptionally low because I stay with my parents! Most of it is incurred when I am out with CZM. This month was much higher because we manage to get hold of Burpple 1 for 1 deals and went to 2 places - Forlino and Tenkaichi Yakiniku Restaurant which cost $236.90 in total! Forlino was pretty good but we were slightly disappointed with Tenkaichi because they were already running 1 for 1 promotion even without Burpple (the difference is only drinks + ice cream) and I guess we are already over the buffet age. Bought FWD travel insurance for our USA honeymoon. The $69.97 is the installment for Surface Pro which I got about 2 years back. I bought black hairspray because I needed to go back to the army camp for a low key reservice. Capitaland - An Undervalued Blue Chip? Capitaland needs no introduction. It is currently the 2nd largest investment in our portfolio and we have recently bought more of it even after the cooling measure. The green arrow indicates that the latest action within 14 days is an increase in position. To be exact, we bought 1,000 @ $3.13 on 6th August 2018. Besides busy preparing for our wedding, I have been spending some time working on a side project. The idea is simple and is based on mean reversion which means that everything will return to their mean/average eventually. I first load a bunch of historical stock prices and pull out 3 different financial numbers (NAV, EPS and DPS) from past annual reports. 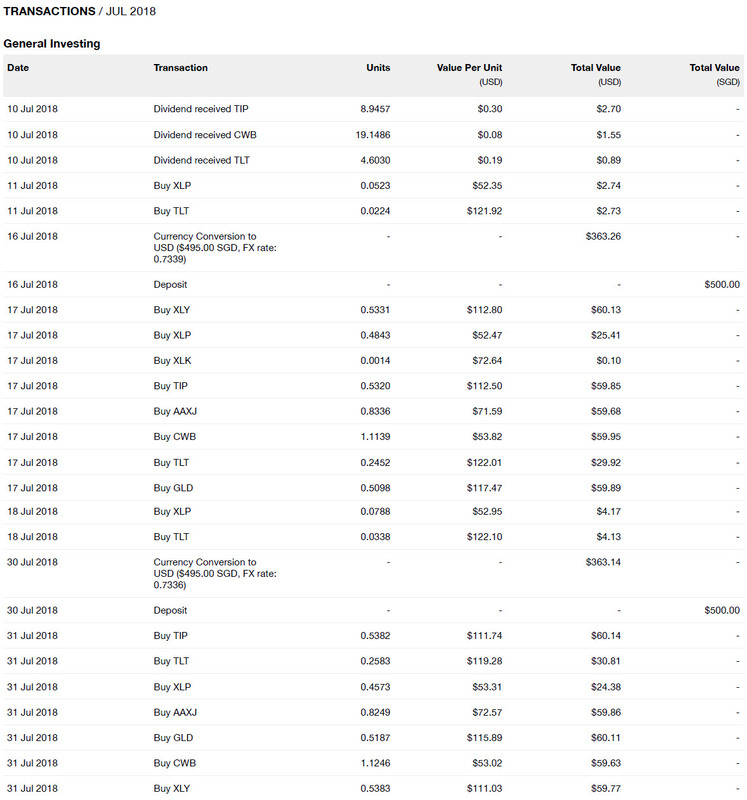 These numbers will allow me to compute the various financial ratios (PB, PE and Dividend Yield). If you have no idea what they meant or what I am talking about, do read up more first. That is more than 16 years of data! The annualized return excluding dividends is 3.37%. Unfortunately, the annualized return including dividends is still a work in progress. Note that the mean price is $3.39. Stock price by itself is meaningless hence the need to use various financial ratios. Based on these data, the mean PB is 1.03, the mean PE is 13.44 and the mean dividend yield is 3.01%. This allows one to know if a stock is undervalued or overvalued simply by looking if the current financial ratios are above/below the mean. To take it further, I try to predict the target price/upside by using the average of both the mean and median. One of the issue/limitation is that the mean can be easily skewed. Before the financial crisis, Capitaland actually once traded at around > $8, PB > 2 and PE > 30! Looking at data after the financial crisis (2010) will remove those ridiculous numbers. Notice how after investing for 8 years, one can actually be sitting at a paper loss (-2.70%) excluding the dividends? The mean price is $3.30 (lower as compared to the above). The mean PB is 0.881, the mean PE is 12.45 and the mean dividend yield is 2.73%. You can see that the numbers are lower, hence more conservative. After all, 8 years is a long time. The policies/cooling measures then would have been very different from what we have now. If I were to use more recent data (within the last 5 years) to account for the more recent changes, interestingly the mean price remains at around $3.30. We are back to a positive annualized return of 2.01% excluding dividends. The mean PB is 0.817, the mean PE is 11.41 and the mean dividend yield is 3.11%. 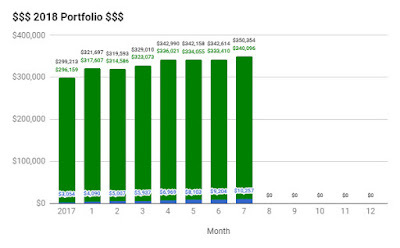 Investing is not as simple as just looking at these few numbers. Otherwise, all the mathematician will be millionaires. Hahaha. Notice how by changing the period/historical data, a different picture will be painted? The same stock/investment can be giving one investor positive paper gain over the years and negative paper loss to someone else. Hence, the entry price is pretty important. Having said that, I have yet to include dividends and I do believe the return should all be positive after that. Time flies! StashAway sent out a 1-year anniversary email around the end of July. 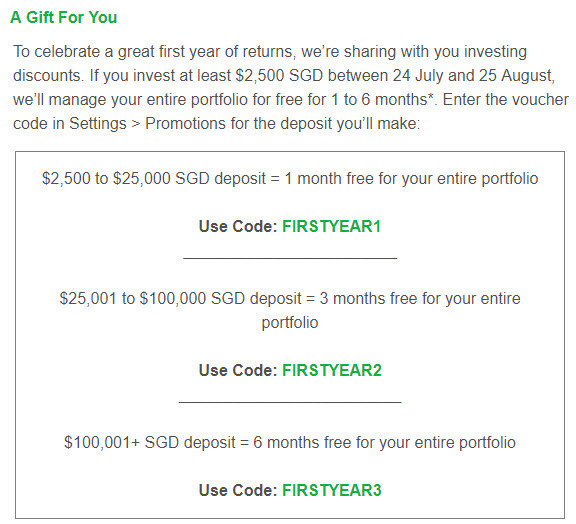 In the email, they shared the performance of the various portfolios (P4, P8, ..., P28) and gave a sneak peek into higher return/risk portfolios which will be introduced in the next few weeks. Rachel Dance from StashAway reached out earlier and provided additional information/charts but I shall not reveal too much until the official announcement is out! To be honest, I am looking forward to that because I do believe at our age we can take on more risk. In addition, there was a "gift" for everyone too. Free management for 1-6 months depending on the fresh fund you invest with them between 24th July and 25th August 2018. I have modified the html (remove my real name) and hosted it here on Github if you are interested in reading the actual email. 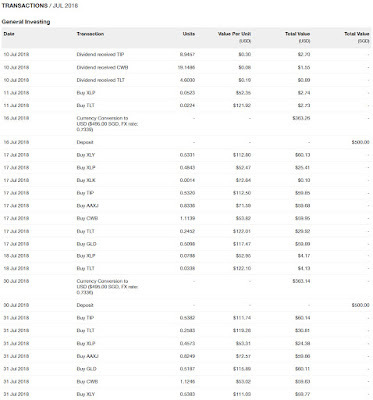 Based on the statement (31 July 2018), we gain $213.52. 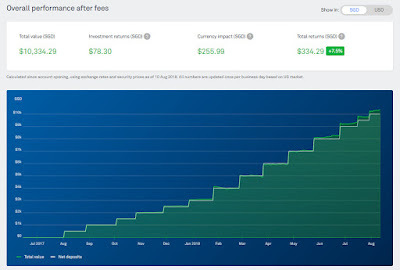 As of 10 August 2018, we gain $78.30 from investment returns with a huge currency impact of $255.99. Not good! In our last monthly update, I said that I would have preferred the USD to be weaker because we will be going to the US for our honeymoon. 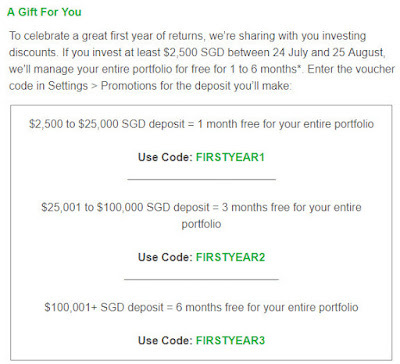 Weaker USD meant that we can convert the same SGD for more USD to invest too. There will be no fee until August 2018 because I recommended some friend. Interestingly, we can see the GST stated as being absorbed by StashAway explicitly in this month statement. Not sure how it works but investors will not complain as long as they are not asked to pay more fees. 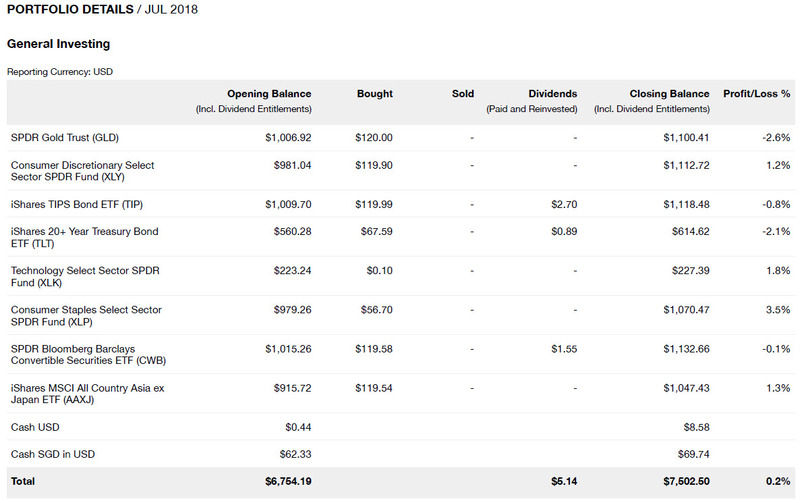 This month commentary: StashAway is the only one making money with an XIRR of 6.49%! One year later, we finally see StashAway's fees > SCB Priority Online Trading commissions. The difference will only continue to get bigger and if such performance can continue, we certainly would not mind paying more fees for a higher return. Like I mentioned previously, those that are already doing DCA on STI ETF, do not be disheartened and stop your investment. Try as much as possible to stick to your plan and in the long run, it will turn out well. Busy busy, it should be evident from the frequency I am blogging and it has been months since I played Monster Hunter! We are currently preparing for Guo Da Li (过大礼) which means more expenses! We have about 2 more months to our big day! So near yet so far! CZM has been asking if I am excited and, to be honest, the excitement has yet to kick in (probably only the day/week before?). I am more worried/concerned that things will not turn out smoothly. Our portfolio increase by 2.26% to $350,354 - $685.20 of capital injection and $7,054.65 of capital gain. Surprise surprise! There were no transactions for the month of July! It was the month when the sudden cooling measure was announced and all the property related stocks tanked and our portfolio was not spared. Unfortunately, we were frightened by the huge drop and decided to stay on the sideline despite knowing that the stocks were trading at a larger discount (in terms of PB). Easier said than done! In addition, we paid our taxes in lump sum (to accumulate miles) and we need to save up for the 聘金 pin jin (betrothal red packet). CZM's parents said they will return her the majority of the money so we have decided to "give" $8,888. If their definition of majority is different from ours then GG. lol.